For continuous quality sound, Alpine wireless headphones are available to use with your Alpine rear seat entertainment packages (PKG-RSE2 / PKG-1000). Passengers can get comfy in the back and privately listen to movies or music of their choice. Never hear the phrase, “Are we there yet?” ever again. Control your compatible Alpine PKG-RSE2 or PKG-1000 from the back seat, right from your headphones. 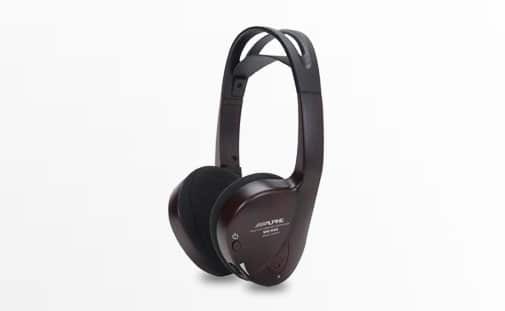 The headphones feature controls on the ear cups, including a volume dial, power switch, and LED indicator. The SHS-N103 also feature an auto shut-off feature to help preserve battery life. Powered by “AAA” batteries.